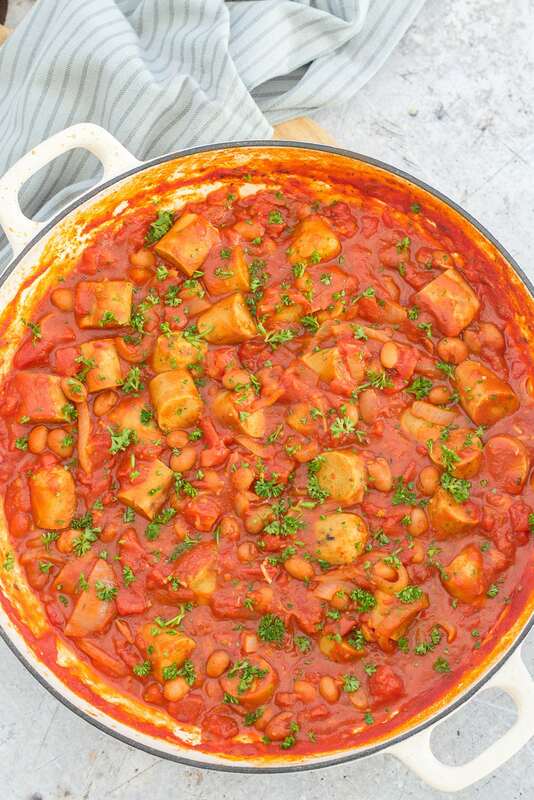 Warming and comforting, my Easy Quorn Sausage Casserole is perfect for chilly evenings. Serve with mashed potatoes, baked potatoes or rice for the edible equivalent of a big warm hug! 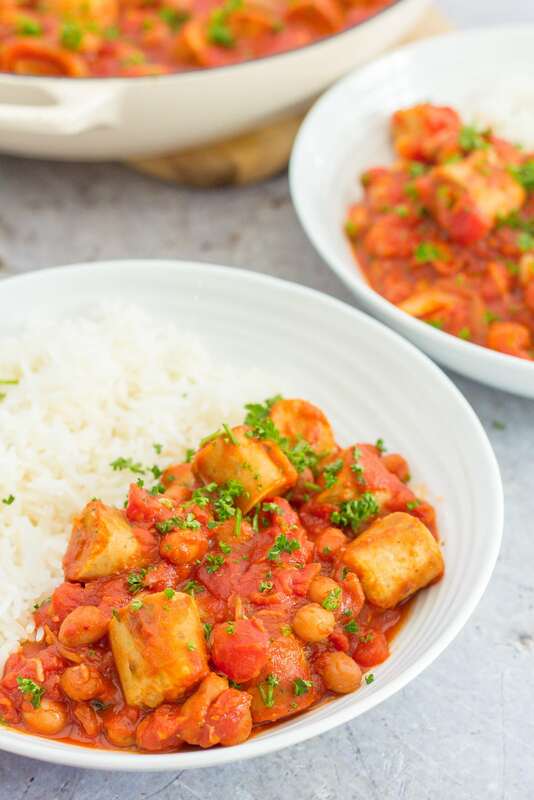 OK so strictly speaking a casserole is a dish cooked in the oven… But my Easy Quorn Sausage Casserole is cooked on the hob to make it easier and quicker for busy evenings. It’s ready to eat in just 30 minutes – and it makes great leftovers… Cook a double portion and freeze the rest for an even quicker and easier meal in the future! 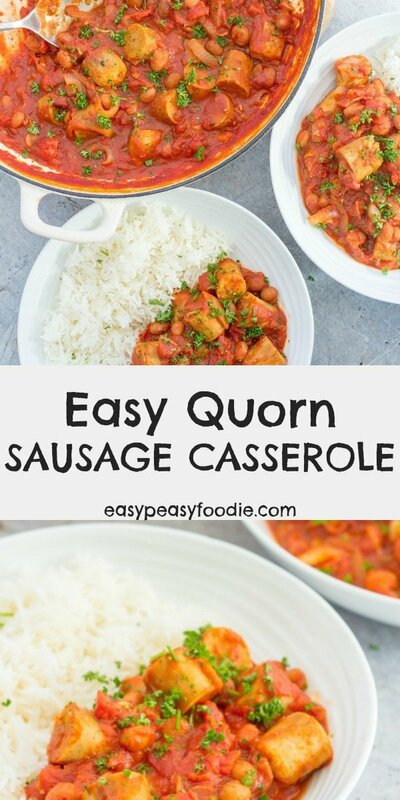 If you prefer this Easy Quorn Sausage Casserole to be cooked in the oven, you can of course do that! Simply omit the last 10 minutes simmering time and instead sprinkle with breadcrumbs and pop it in the oven at 180C (160C fan/ gas mark 4/ 350F) for 20 minutes until golden and bubbling. Alternatively, you could prepare this Easy Quorn Sausage Casserole in advance and then reheat it in the oven. You would need to allow a little longer in this case 25-30 minutes should do it. 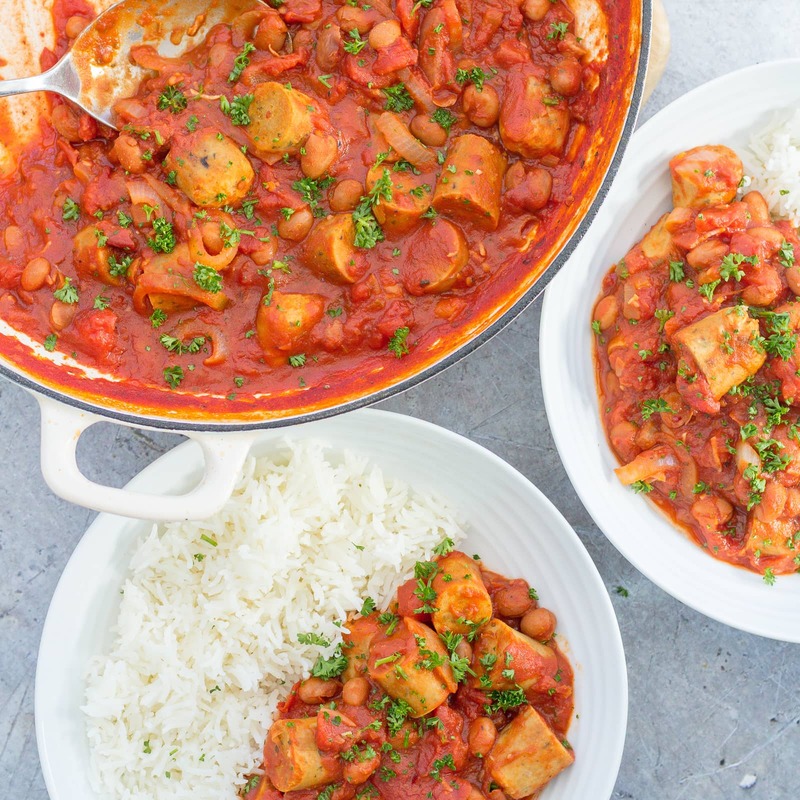 I like to serve this Easy Quorn Sausage Casserole with rice but it would be just as tasty with a big hunk of crusty bread, mashed potato, baked potatoes or even pasta. It’s really very flexible. Either way it’s delicious, hearty and warming. Perfect for chilly evenings! 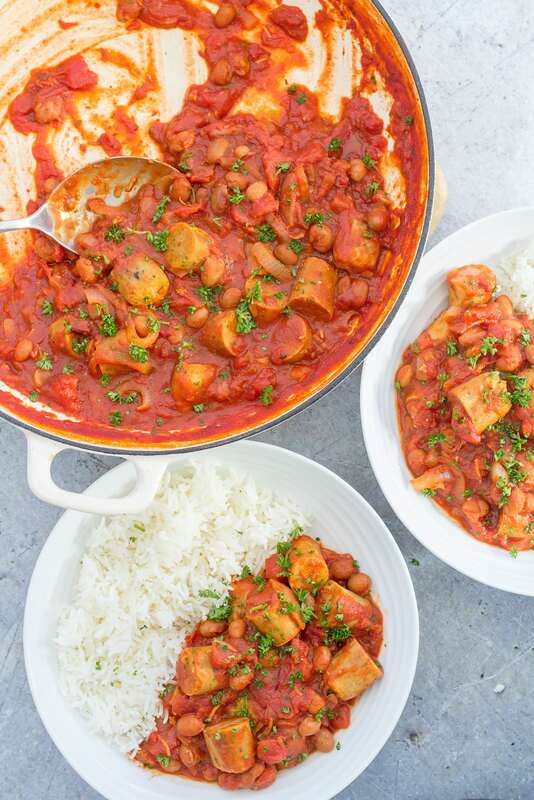 This dish has a wonderful savoury, spicy, herby flavour that would go brilliantly with a red from the Rhône valley or something from the south west of France like a Madiran or a Cahors. Fry the sausages in a little olive oil until cooked. Tip the sausages out onto a plate. Add the sliced onions to the same pan. Put the lid on and turn the heat right down. Cook gently for 5-10 minutes until starting to brown. Stir occasionally. While the onions are cooking, slice the sausages into 3 or 4 pieces. Add the garlic and chilli flakes to the onions and fry for 1 more minute with the lid off. Stir occasionally. Bring the casserole to the boil and then turn the heat down and simmer with the lid off for 10 minutes. Serve with rice, mashed potatoes, baked potatoes or crusty bread. If you prefer this Easy Quorn Sausage Casserole to be cooked in the oven, simply omit the last 10 minutes simmering time and instead sprinkle with breadcrumbs and pop it in the oven at 180C (160C fan/ gas mark 4/ 350F) for 20 minutes until golden and bubbling. I have never tried Quorn before, but I’m trying to get at least one vegetarian meal per week into our diets. When I ask the hubster, “what would you do differently?” about said vegetarian meals, his response is almost always, “add meat”. 😛 So I think I’ll try Quorn and see if I can pull a fast one on him. This dish looks super delicious, and I’m sure he won’t even notice! This looks absolutely delicious Eb! Such a warming comforting meal. I think a sausage casserole like this is great for an easy midweek meal although like Michelle, I also have yet to try cooking with quorn. Thanks for sharing with #CookOnceEatTwice!